Orca Gold Discovers Significant Wat | Orca Gold Inc.
VANCOUVER, BRITISH COLUMBIA--(Marketwired - July 5, 2016) - Orca Gold Inc. (TSX VENTURE:ORG) ("Orca" or the "Company") is pleased to announce significant positive results from an ongoing water exploration programme at Block 14 and to report on the timing of the delivery of the Preliminary Economic Assessment ("PEA"). To date the Company has defined an Indicated Resource of 27.6Mt grading 1.83g/t for 1.63 million ounces of gold and an Inferred Resource of 10.3Mt grading 1.8g/t for an additional 0.6 million ounces (based on a 1g/t cut-off grade (News Release: February 4, 2015) at the Galat Sufar South ("GSS") and Wadi Doum prospects on Block 14. Mineralisation is robust with true widths up to 85m and >75% of resources within 150m of surface. Based on geophysical surveys completed in late 2015, a follow up drill programme, testing two low resistivity anomalies hosted within the Cretaceous Nubian Sandstone basin just north of Block 14 (Figure 1), is currently underway. 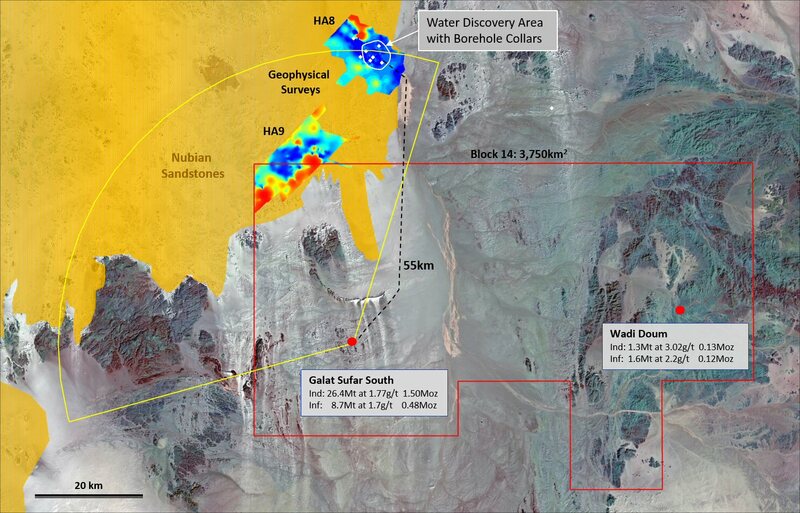 Six holes have been completed on the first geophysical anomaly (HA8), 50km north of the GSS Resource, where a single borehole drilled in 2014 had intersected water bearing sandstones. Four of these six new boreholes have intersected numerous water bearing layers between depths of 34m and 148m within an interbedded sequence of course grained sandstone and sandy clays. This new drill programme has now defined an aquifer system over an area of approximately 13km2 (Figure 2), with the potential to expand the discovery to the north, east and south. The Nubian Sandstone sequence at HA8 consists of multiple layers of coarse, medium and fine grained sandstone bounded by layers of mudstone, siltstone and clay. Water strikes are related to a number of course and medium grained sandstone units within the sequence. The combined average thickness of these water bearing units is between 16m and 20m. Secondary water bearing horizons may also be contributing to the water flow. Water yields increase with depth and it is fair to assume that yields may increase further for boreholes GSBH006, 12 and 13 if drilled deeper on the basis that the basement floor may act as an aquiclude. It appears that some recharge of the aquifer system takes place. Subject to a more detailed phase of pump testing and confirmation of aquifer characteristics, the aquifer system defined to date has the potential to supply +30 million cubic metres of water to the Block 14 project. This latest water drilling programme is now testing a second geophysical anomaly HA9, located closer to the GSS Resource. Upon completion of the drill programme at HA9, the rig will return to HA8 to test the deeper levels of the sequence. A new water programme will then be budgeted towards determining aquifer hydraulics and potential production rates. The PEA is being supervised by SGS Time Mining of South Africa, with input from Deswik Mining Consultants (UK), SRK Consulting (UK), GCS Water and Environmental Consulting (RSA), Mineesia Environmental Consultants (UK) and SGS Mineral Services (RSA, UK, Canada). The PEA analysis and preparation is running on schedule for completion in the first half of July and results will be reported after review and approval by the Company's Board of Directors, expected by the end of July. Hugh Stuart, President and CEO, commented, "Water is clearly a major factor in the development of a gold mine, particularly in a desert environment. The results of this latest water exploration programme go a long way towards ticking that box. 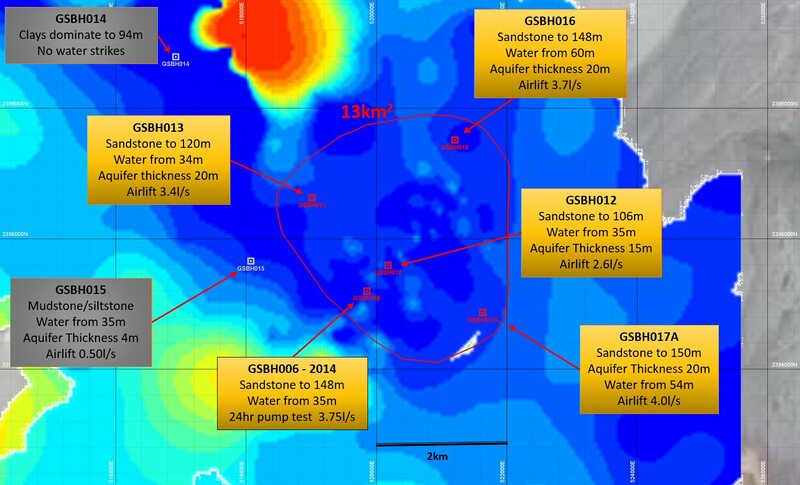 Final pump tests will soon be carried out, but we consider the discovery and scope of the aquifer identified at HA8 as a major milestone in the development of Block 14 as a commercially viable project." Orca Gold Inc. is a Canadian resource company focused on exploration opportunities in Africa. The Company has an experienced board of directors and management team and a strong balance sheet, with a treasury of CAD 16.5 million at end Q1/2016. developments; environmental risks; insurance risks; capital expenditures; operating or technical difficulties in connection with development activities; personnel relations; the speculative nature of strategic metal exploration and development including the risks of diminishing quantities of grades of reserves; contests over title to properties; and changes in project parameters as plans continue to be refined. Forward-looking statements are based on assumptions management believes to be reasonable, including but not limited to the price of gold; the demand for gold; the ability to carry on exploration and development activities; the timely receipt of any required approvals; the ability to obtain qualified personnel, equipment and services in a timely and cost-efficient manner; the ability to operate in a safe, efficient and effective manner; the expected timing, costs, and results of a PEA; the expected burn rate; the regulatory framework regarding environmental matters, and such other assumptions and factors as set out herein. Although the Company has attempted to identify important factors that could cause actual results to differ materially from those contained in forward-looking information, there may be other factors that cause results not to be as anticipated, estimated or intended. There can be no assurance that such information will prove to be accurate, as actual results and future events could differ materially from those anticipated in such information. The Company does not undertake any obligation to update forward-looking information if circumstances or management's estimates, assumptions or opinions should change, except as required by applicable law. Accordingly, readers should not place undue reliance on forward-looking information contained herein.